June 29, 2010: The Study Group on Health Governance is part of the larger initiative on Global Governance by the school. Sania Nishtar, President Heartfile attended the meeting as a special invited guest on June 28-29, 2010. This comment is a review of the health sector policy announced in the budget speech as part of which a new health insurance scheme will be launched for the poor under the rubric of the federal government’s safety net program. There are two elements in this policy intent. One relates to protecting the poor and the other centres on the means of enabling that. The standalone rationale for both of them is strong. In principle, the decision by the government to financially risk-protect the poor against the vicissitudes of health is an admirable step since health problems constitute the most common economic shocks faced by poor households, as evidenced by the Planning Commission data. On the other hand, health insurance is a proven means of achieving financial risk protection. However, it must not be perceived that health insurance is the only way of protecting the poor against the risk of healthcare shocks in Pakistan’s context given that there are other simpler ways of enabling that. Before I dilate how that can be the case, some conceptual clarifications about the state’s role in health financing are offered. The state is meant to ensure that health is financed through public means; either through ‘revenues’ or by ‘pooling’ financial resources. There are two ways of ensuring the latter: one is through insurance and the other is by creating pools of funds, through which cash transfers are made to fund waivers in hospitals for the poor. The idea central to public means of financing is fundamental to protecting people against having to pay out-of-pocket to access healthcare. Some developed countries, which provide universal health financing coverage predominantly, use revenues to finance healthcare, as in the United Kingdom whereas another group of countries, of which Germany is the prototype, use insurance as a means of pooling. Pakistan’s health system is modelled on the UK’s National Health Service. The Bhore Commission Report (1946), which served as the basis of institutional planning immediately after Pakistan’s inception and the Beveridge Report, the blue print for the UK’s National Health Service, had common authors and emerged around the same time. Pakistan’s public health system, therefore, has a strong post-colonial imprint with a ‘national health services’ model operating, albeit with several gaps. Revenues finance the public system, which comprises over 15,000 health service facilities. Of course there are many pitfalls, lapses and gaps within this arrangement. Absent and ‘ghost’ health workers, closed basic health units, overcrowded hospitals, poor quality and performance are well-described manifestations of Pakistan’s graft-ridden state health system, where inefficiencies are pervasive. This notwithstanding, its original character which embodied universal coverage principles must be brought to bear if any improvements are to be envisaged through reform measures. Within this context, it must be appreciated that in this health systems model there is a multi-layered system of social protection already operational. Notional costs are levied at primary healthcare facilities for consultations. In hospitals, some costs at notional but most user’s charges are subsidised. There is a mechanism to waive user’s charges for the poor and a system functioning to label ‘the poor’ so. Essentially a local government certified Zakat certificate entitles the needy to free services that involve a user charge in public hospitals up to a limit of approximately 20,000. Over and above this, high-cost diagnostic and invasive procedures not funded through Zakat are meant to be financed through Bait-ul-Mal. These instruments do have their share of problems. Narrow coverage, poor targeting, lack of predictability about the size of the envelope, opportunities for patronage and abuse, lack of transparency in the use of resources, and corruption scams are some of these. However, with the right ‘targeting tools’ interfaced with the National Database Registration Authority and appropriate tracking technologies, some of these systemic fault-lines can be cemented. There are hospitals where these instruments are making a positive impact despite existing weaknesses and there is every reason to believe that their effectiveness can be enhanced with remedial measures. Within this context, if the government’s intent evident in the budget speech is to enhance financial risk protection for poor families, then the most plausible thing to do would be to ensure preferential access of the Benazir Income Support Programme (BISP) target families to exemptions/waivers in the existing social protection programmes. Various identification tools can be used for such families, which can allow them a special status in existing arrangements. The additional cost incurred in treating these patients through Zakat and Bait-ul-Mal can then be off-set by funds, which the government envisages allocating for health under the BISP and which currently, are earmarked for insurance. If appropriately implemented this strategy will help achieve the objective of “improving access of target families of BISP to health care services” with far greater rigour, and efficiency compared to the health insurance route currently being explored. In the proposed model, there would be no need to get into complex institutional reorganisation from the governance standpoint, which is needed to support the shift in health financing implicit in the new model being envisaged. The risk of alienating the departments of health would be minimised since strengthening the existing arrangements would also be in their interest. The potential of garnering their support as a result thereof would be high. Thorny considerations of commercial viability vis-à-vis returns on public investments would also become irrelevant. Most importantly, the proposed model would not restrict ‘covered’ healthcare costs to Rs25,000, which is what the insurance ceiling will allow for a family per annum. Instead, it will allow financial risk protection against catastrophic health expenditures, which involve much higher healthcare costs. In fact, this in essence, should be the objective of any health-related social protection programme. Furthermore, the strategy could have a positive knock-on systems-wide effect given that this would also be an opportunity to address some of the systemic avenues for exploitation, which exist within current channels. The argument in favour of health insurance for this population in terms of its potential to draw on the private sector to deliver state-financed services is also somewhat out of line. On that score, population-based data from Pakistan Social and Living Standard Measurement Survey is telling in relation to the predominant role of public hospitals for the category of services being considered. This further substantiates the need to strengthen social protection financing. Here it is acknowledged that levering the outreach of the private sector for delivering essential services is a critically needed reform measure. But there are significant legislative and institutional implications, for which the ground is not prepared yet. It is also acknowledged that health insurance, per se, is an important health financing strategy with its own applications even in Pakistan’s health system, where revenue is the main public means of financing health and that there are ways in which the base of social, private and community health insurance and Takaful can be broadened. In sum, the standalone rationale and merit of the reform measures is not being questioned. It is a question of achieving clarity in the policy objective and structuring the most appropriate means of achieving that. If the priority is to financially risk-protect the poor for health and to do it in the most cost effective and straightforward manner, then the government must rethink its current technical approach. The discouraging response of insurance companies to the expression of interest for the programme, admitted by the BISP managers, is also evidence of the need to do so. 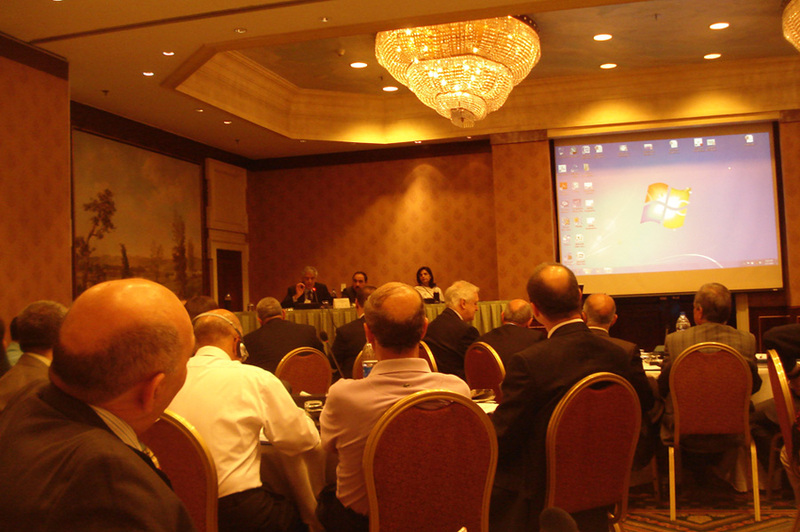 June 07, 2010: Sania Nishtar gives the keynote address at the ‘Regional Conference on Achieving better health equity and efficiency in Middle East and North Africa,’ organized by the MENA Health Policy Forum in Amman, Jordan. Pakistan is faced with many unprecedented challenges. Ongoing acts of terrorism, the executive-judiciary confrontation, threats of environmental disasters looming with the Hunza lake bursting at its seams and a storm whipping up in the Arabian sea, a relentless energy crisis, a tough balancing act in the forthcoming 2010-11 fiscal policy, and many others. With many pressing governance concerns at hand, health reform may appear low on the list of priorities. That notion is misplaced for three reasons. Firstly, health reform is usually an elective process or a course, which is adopted by choice. However, at times it is inadvertently forced on the system because of certain institutional changes that are made outside of it. Such changes in the functioning of the state have already been made in Pakistan and have altered the equation of responsibility in favor of the provinces vis-à-vis the federal government as far as health is concerned. The 18th Amendment to the constitution, the 2010 National Finance Commission (NFC) Award, ongoing reorganization of the devolution initiative are not just political-point-scoring decisions, they have a deep bearing on the executive’s functioning and the manner in which governance has to be reorganized in response to changes in structural norms. The 18th Amendment abolished the Concurrent List under which health was a subject in the purview of both the provinces as well as the federal government. The Local Government Ordinance 2001 stands omitted from the Sixth Schedule of the Constitution and therefore provinces have the prerogative to restructure the local government system according to the mandate in Article 140-A. Under the 2010 NFC Award provinces also have additional fiscal resources to support plans. These institutional changes can be an entry point into health reform with respect to reorganizing the stewardship capacity of state agencies—Ministry of Health and departments of health—which is an important element of any reform measure. Secondly, the federal government’s budget 2010-11 is just around the corner. This time round under a new fiscal model—the Medium Term Budgetary Framework—indicative ceilings have been stipulated for ministries for a three year period. This is a time window during which handling of responsibilities from the federal to the provincial government as outlined by the 18th Amendment have to be completed. Since the budget is one of the key instruments through which fiscal allocations can signal the directions of change, clear directions must be agreed upon. The third imperative for health reform stems from poor health status of the country’s population and the need for measures that aim to improve returns on health spending by seeking to address constraints imposed by poorly functioning public systems. Understanding these challenges and the means of their mitigation assume great importance in Pakistan at a time when the need to deliver welfare to the people of the country has never been more dire, given the country’s prevailing geopolitical challenges. Heath reform is not a short-term measure. Sustained political will, consistency of policy direction and the resolve and capacity to cascade multidimensional changes in a sequenced manner as tangible action into coordinated policies, laws, and institutional arrangements is a prerequisite for its implementation. There are many political and technical capacity constraints, which stand in the way of achieving this in today’s systems of governance. That notwithstanding, the institutional changes, which have been forced on the health system should be used to reorganize stewardship capacity of state agencies. This would, in any case be a prerequisite to implement the reform process if and when the country’s technical and political capacity constraints are overcome. The opportunity should also be seen in the context of other opportunities in the country that can be capitalized for improvements at the health systems level. Of particular note in this connection is the space that exists to exercise leverage on the potential within public-private engagement to make pluralism in service delivery work for equity and quality. The promising prospects of harnessing the potential within the country’s telecommunication boom to mainstream technology in health systems for gains at several levels, is another. While yet another is Pakistan’s extensive public sector institutional infrastructure, which can be reformed with regulatory interventions and payment and incentive systems. Stewardship agencies need to be reconfigured to reap these low-hanging fruits as a priority. There are changes needed to reconfigure stewardship capacity at all three levels—federal, provincial and district—in order to do that. At the federal level, the Ministry of Health has an important role even after measures, which have granted provinces more health-related autonomy. However, its core mandate after the 18th Amendment appears to center around normative tasks, coordination, resource mobilization, information and evidence, disease security, ensuring compliance with international health regulations, and streamlining trade in health and the aid effectiveness agenda. Many changes are required in its culture to align its functioning with this mandate. Currently the ministry is swamped by management of a few tertiary care hospitals and manning operational controls of the national public health programs. Its functionaries are overwhelmed by administrative tasks, and managing its subordinate, attached, and allied or ‘autonomous’ departments. As a result the space for normative and strategic work has been crowded out. Much of the time of its functionaries is spent in, which can function better with devolved controls, albeit with appropriate oversight. Its planning infrastructure is weak and there is no institutional entity responsible for human resource planning; the potential of its functionaries remains largely un-harnessed. The ministry’s capacity is also limited to ensure compliance with international health regulations and serve one of its core roles, which relates to the information-evidence-policy cycle. It is performing a mix of normative, regulatory and implementation tasks often with lack of needed separation. A revamped ministry needs to concentrate on its core mandate and develop its capacity in these areas. In the pre-18th Amendment and NFC 2010 era the ministry embarked upon the process of formulating a new national health policy with an operational flavor, which must now be revisited and its orientation changed to one that resonates with the new mandate of the ministry. Provincial agencies—the departments of health—require a different set of competencies. They have to develop the capacity to plan, implement and oversee a reform process that expands the focus of primary healthcare both with reference to the set of services to be delivered as well as the first point of contact with individuals. In order to achieve this they need to develop capacity to regulate service provision by non-state actors to whom services have been contracted out under programs launched in the last decade and develop protocols for intra-organizational contracting of services from one level of the government (provincial) to another (the district). At the third tier of government, the need for operational clarity vis-à-vis divisional and district roles is urgent since tussles at this level are undermining service delivery. Districts additionally have to develop capacity to integrate national public health programs with district accounting and accountability channels and hone designated roles for management, quality assurance, evaluation and inter-sectoral collaboration. Health reform can have many entry points—changes in financing, service arrangements, payment and incentive systems, labor market interventions and social protection arrangements. However for each, institutional capacity at the stewardship level is a prerequisite. There is an opportunity today to draw upon the external drivers to reconfigure systems of governance facilitate health reform. A critical opportunity will be lost if we fail to do so.